Alone in the Dark was originally released way back in June 2008 on Xbox 360, Wii, PC and PS2, and received its fair share of bad reviews. 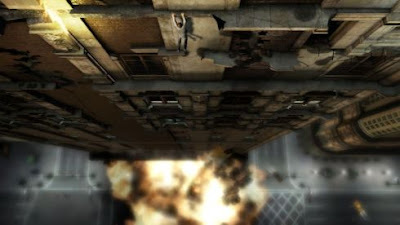 Despite its negative reception, developer Eden Games released a PS3 version in November 2008, patching it up to lessen glitches and generally improve the experience, as well as donning it with the subtitle of Inferno to distinguish it from its counterparts. Having never played the original versions of this game I cannot really comment on how much of an improvement the Playstation version is, but I do know that this is actually a pretty good game. 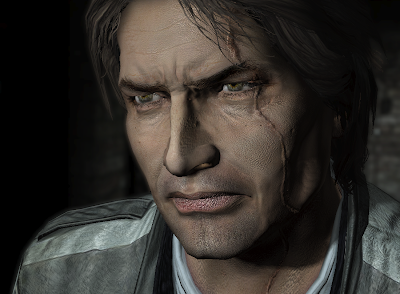 You play as Edward Carnby, a paranormal investigator, who awakens in a building where he is being imprisoned. Soon after, he is led to the roof to be killed, only saved when his captor is killed by something unseen. Trying to escape the slowly collapsing building, he witnesses several people killed or possessed this evil force, before meeting art dealer Sarah Flores. Together, they reach the car park, where they find Theophile Paddington, an old man who claims to know what is going on, and who Edward really is. He explains that the chaos has been caused by a stone, when a man named Crowley released the power inside. 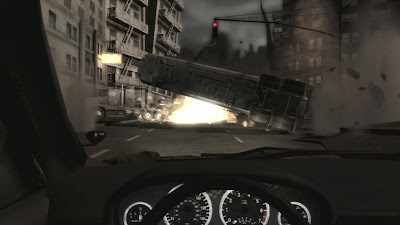 Escaping by car through the apocalyptic New York streets, they reach Central Park, where the rest of the game takes place. While I've never been to Central Park, my primitive comparisons using Google Earth showed that the real life park and it's virtual representation were pretty similar, at least in terms of layout. Beginning the game, you'll wake up in first person mode, and will continue to be in this mode for some time before the game switches into third person. From that point on, you are able to switch back and forth at will via use of the triangle button, and for the majority of the game you can stay in whatever mode you prefer. However, performing some actions requires you to be in a specific view: for shooting, you'll need to be in first person, and it's often easier to use this mode when shining the torch into the eerie darkness, whereas third person mode is used for climbing and melee combat. First person is a little clunky, and aiming can be tricky, however a ridiculous amount of auto-aim kicks in to help you land your shots. Both modes are good enough for general play, but could of done with some refining. The game tries to make use of several 'innovative' features. In order to survive, you'll need to craft weapons out of anything you find, with one of the game's loading screens boldly proclaims that the crafting possibilities are endless and are only limited by your imagination. While this isn't quite true, there are plenty of craftable weapons to play around with, including aerosol spray flame throwers and makeshift Molotov cocktails. Other helpful, less damaging items can be crafted too, such as sticking double-sided tape to a glowstick or emergency flare in order to create a light source that can be stuck to walls to illuminate the darkness. To craft or select items, you'll need to dive into your coat. It's separated into two sides, with the left-hand pockets holding items such as bullets, handkerchiefs and your lighter, while the other side is home to bottles, sprays, glowsticks and flares. In the middle are your pistol and your torch, both vital during the course of the game. It's a great idea, making you manage your items to conserve as much space as possible, and it looks good too, but it breaks up the action too much, and despite supposedly pausing the game around you, I have been injured while in my jacket, so I'm not sure that this always work. To speed up switching items, pressing L2 and R2 will switch items currently being held in your left and right hands, and a helpful Favourites menu can be used to allocate up to four different combinations that can be accessed with a simple push of up on the d-pad, and then either X, circle, square or triangle. Another display of originality is the ability to freely manipulate objects that Edward is carrying. There are plenty of items that Edward can pick up, from baseball bats to swords to chairs, and a press of L1 locks on to your target, and tethers the right stick to Edward's arm movements, allowing for precise placement. 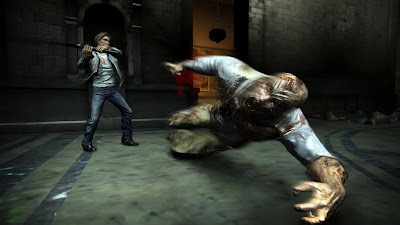 More vigorous use of the stick will allow Edward to strike out with whatever is in his hands, which is used to melee enemies, or break down locked doors. However, most of the time you'll be wanting to pick up something flammable, and hold it in some flame in order to set it alight. 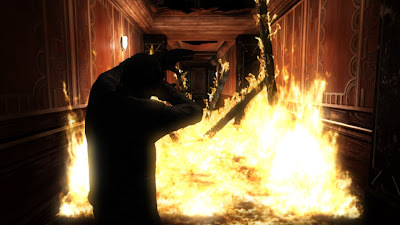 Fire plays a vital role in Alone in the Dark, simply because it is the only way to permanently down enemies. Hit them as many times with a lampshade, or slice them with a katana, and they'll never be down for long, but set them on fire, and they'll evaporate into the air. The easiest way to ignite an enemy is to pour flammable liquid on to your bullets, allowing you to fire... fire. It's one of the least believable weapons in Alone in the Dark, but it certainly is helpful for killing enemies. With fire so prominent in this game, it's lucky that the fire physics are excellent, spreading and damaging all combustibles in its path and often causing them break apart. Bottles of flammable liquid can be used to create a trail leading up to violently explosive objects, such as cars or tanks of fuel, allowing you to light the 'fuse' with your lighter and set off explosions from afar. 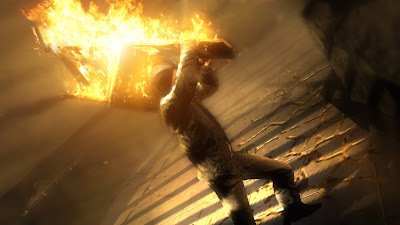 As well as starting fires, a lot of the time, especially during the first Episode inside the collapsing New York building, you'll be putting them out. Some times fires extinguish themselves, however you'll normally have to do it yourself, with conveniently placed fire extinguishers that seem to contain infinite amounts of fire retardant spray - be sure to put it all out as the fire will begin to spread again as soon as you stop spraying. The game plays out like a TV or DVD series, being split up into Episodes, with each Episode ending on a cliffhanger. Returning to the game after quitting, you will be shown a short 'Previously on Alone in the Dark' video, which highlights the main events so far. You can skip these and jump straight into the game, I actually found myself watching these because I actually quite liked them. However, the TV/DVD series stylings don't stop at the cosmetic. Alone in the Dark allows players to jump between chapters within an episode, or even advance through entire episodes, effectively allowing players to skip portions of the game, ranging from minutes, to hours. This is designed for when you get stuck, however, to me, this seemed completely bizarre. One scene that many found themselves wanting to skip was the infamous 59th Street driving sequence. Inferno apparently improved the driving mechanics, and this section actually went fine for me, and I completed it the first time, although I'll admit driving throughout the game can be a little tricky in parts, with the cars seeming very fragile and keen to bounce around. Performing the 59th Street sequence in first person to earn the Cockpit Addict trophy was quite tough, and I wouldn't recommend driving in first person unless trying for this trophy. Throughout the game, you are only forced to use a car a handful of times, however Central Park is quite large, and you will likely want to travel by car to speed up journeys, and avoid being assaulted by any nasties lurking in the dark. There are plenty of cars strewn around the park, and are helpfully marked on your map so you can find them easily. To get going, you need to get into the car - either by just opening the door, or smashing the window and opening from the inside if it's locked - and then start the engine. This can either be done with a key, that will either be found already in the ignition or 'hidden' in the sun visor, or by hotwiring. Initially, this can be a little tricky, especially as removing the wires seems to cut the interior lights meaning you are physically unable to see what you are doing. However, once you realise that the cars will always start by connecting either both blue or both yellow wires (and more often than not, the yellows) then hotwiring becomes unbelievably easy, and slightly pointless. There are a variety of enemies to contend with, the most common of which are Humanz (of which there are several varieties), Ratz and Vampirz, which, before the disaster, were people, rats and bats, respectively. There are also some large boss monsters to fight, black goo that swallows you but is repelled by light, and 'living' cracks that run through the walls and floors, also trying to swallow you, that are defeated by fire. Unfortunately, the goo sometimes seems to completely ignore the light and swallow you anyway, and the cracks seem impossible to defeat using a flaming object that you are holding, as you can not hold the object at a level where it will touch the floor. Additionally, upon being dragged around by these cracks, quick time events will appear, and I had lots of trouble being killed despite performing the on-screen actions. Edward does get hurt a lot during his battles with enemies and run-ins with fire, and instead of a standard health bar, Edward's injuries are shown physically on his body, with his clothes getting ripped and cuts appearing. To heal yourself, you'll need to find some Medical Spray, and press right on the d-pad to access the Healing Mode, where can then spray the stuff on to heal up your wounds. Some wounds will cause haemorrhaging, which will cause you be bleed out and die after roughly 6-7 minutes. 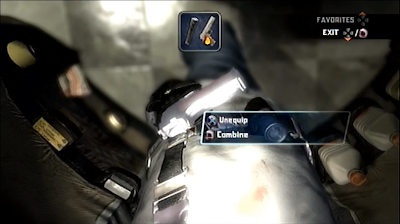 To stop yourself from dying in this scenario, you must bandage the wound, and if there aren't any bandages in your jacket, this often starts a desperate search for some, however I found that the bleed out time period can be completely cancelled if you make it to the next main checkpoint before you die. Many complaints about this game stemmed from glitches, and while I didn't encounter too many problems throughout, it certainly isn't bug free. At one point, I had to restart the checkpoint because I was trapped inexplicably between a piece of rubble and Sarah, and there was also a rather serious graphical error where the floor of the car park during the first driving sequence began switching between normal height and a height about 2 foot above normal, meaning my car appeared to be half submerged in a flickery black mess. Another irritating bug was caused by being unable to fit through a door that I had blown open, and being unable to force it further no matter what I threw at it. There were also some general issues during gameplay, with the occasional frame rate drops and screen tearing noticeable at points. Graphically, Alone in the Dark is a mixture. Character models, especially the faces, are very detailed, however some parts of the park can look very ugly, as if the developers weren't expecting anyone to actually go there. The lighting both makes and breaks the looks in this game, and in places it looks amazing, however situations with lots of dynamic lighting can cause frame rate issues. Similarly, the sound has both good and bad qualities. The haunting, Bulgarian choir soundtrack is simply amazing, and really sets the pace of the game; the voice acting, on the other hand, isn't so great. While all the main characters are voiced reasonably well, some of the minor characters are voiced terribly, and the amount of swearing in this game is ridiculous - it seems not even one cutscene can pass without containing at least one obscenity. While swearing doesn't offend me, most of the time it just seemed unnecessary. And, upon finishing the game's story line, you will be given a decision, which then cues one of two final cutscenes (depending, of course, on what decision you made). However, neither of these cutscenes tie up all the loose ends, and just leave the game with no real ending - and with poor review scores and sales, sequel Alone in the Dark 6 probably won't be releasing any time soon. Overall, Alone in the Dark is a decent survival horror game that utilises several unique and innovative techniques to try and draw you into Edward Carnby's world, sporting an amazing soundtrack and a great fire physics engine, however it falls short with gameplay mechanics aren't quite as tight as they should be, and graphical and gameplay glitches that detract from an otherwise great game. 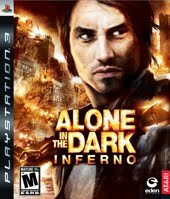 However, if you are looking for a cheap survival horror game, then look no further than Alone in the Dark: Inferno.